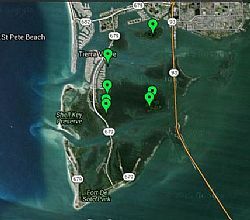 The Friends of the Tampa Bay National Wildlfe Refuges have planned a day of invasive plant removal on the islands of the Pinellas National Wildlife Refuge (see map, left). The Friends urgently need volunteers to help with this effort, which will take place on Friday, September 25th. You do not need a boat. Transportation will be provided. Established in 1951 as a breeding ground for colonial bird species. The islands provide densely vegetated mangrove habitat and include Indian, Tarpon, Mule and Jackass Keys. Tarpon Key once hosted the largest Brown Pelican rookery in the state of Florida. To protect the abundant seagrass beds, motor boats are not permitted on the surrounding flats. Due to their critical importance, the islands are closed year round. If you can help, please contact Dave Howard.